Starting in 2011, the Xerces Society began compiling records of milkweed and monarchs from across the western U.S. We reached out to biologists, land managers, and herbaria to start building a collection. In 2015, we partnered with the Pacific Region of the U.S. Fish and Wildlife Service to better collaborate on record gathering and hatched a monarch and milkweed habitat suitability modeling project. The data used in the modeling included occurrence records gathered via crowd-sourcing (e.g., online surveys, Flickr) and existing herbaria and biodiversity datasets (e.g., BISON). Phase I of modeling provided preliminary information about suitable habitat for monarchs and milkweed, but it also became clear that we were missing data for large parts of the West. In order to improve the models, the U.S. Fish and Wildlife Service, Xerces Society, Idaho Department of Fish and Game, Washington Department of Fish and Wildlife, and others partnered to conduct extensive on-the-ground surveys in Oregon, Washington, Idaho, Nevada, and parts of other states in 2016-2017. Idaho even used Phase I of the modeling to design a sampling scheme across the state for showy milkweed (A. speciosa) which provided valuable ground-truthing. We also launched the Western Monarch Milkweed Mapper website to gather data collection from citizen scientists and provide an interactive, publicly accessible place for everyone to share and view each others’ records. The surveys and website drastically increased the number of high-accuracy records we had across the West in a short period of time. We then used the highest accuracy records out of more than 40,000 records amassed to run Phase II of the habitat suitability model through a partnership with the U.S. Fish and Wildlife Service, Xerces Society, and the University of Nevada-Reno in 2017-2018. Model results included milkweed species’ specific models, models of adult monarchs, and models of breeding monarchs (without tropical milkweed A. curassavia which is non-native but planted in gardens). Two important model products include the maximum milkweed suitability (L) and monarch breeding without tropical milkweed (R) maps. What Does the Modeling Tell Us? Modeling shows us that, consistent with the wide-ranging nature of the monarch butterfly, suitable breeding and migratory habitat is widespread across the West. 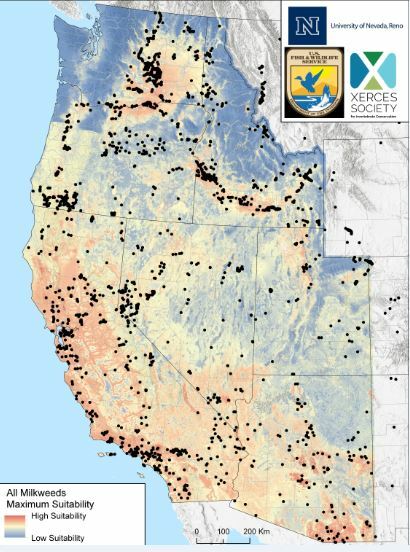 The modeling results show there are notable concentrations of potentially highly suitable habitat in the Central Valley of California as well as in southern Idaho and eastern Washington; smaller areas are evident across northern Nevada, southern Arizona, parts of Utah, most low-elevation lands in Oregon excluding the coast, and other areas (see Figure 6). The Central Valley and adjacent foothills of the Sierra Nevada of California are particularly important because monarchs likely pass through these areas on both their spring and fall migrations to and from interior and northern western states. These areas can be prioritized for monarch habitat protection and management. In some areas, and within habitat types that are suitable, restoration or enhancement may be appropriate. We recommend using a combination of the milkweed and monarch breeding models to prioritize areas for monarch habitat protection, management, and restoration. The milkweed models–both species-specific and the combined “all milkweed” model–represent areas which are potentially suitable for milkweed based on environmental covariates. The monarch breeding model (excluding tropical milkweed) is a more restricted model–based upon where we know monarchs use milkweed across the West. This is a very useful model in helping us understand not just where milkweed grows, but where monarchs are actually using milkweed. However, this model should be used with caution since we have many fewer breeding records compared with milkweed records and the breeding records are particularly biased towards areas with high human populations; so the model is likely under-valuing some of the areas currently shown as “low suitability”. Hence, we recommend considering both milkweed and monarch breeding models when making decisions about which areas are the highest priority for monarchs in your region–ideally by comparing the models of milkweed species you are considering including in your restoration efforts. In addition, you should consider the historical occurrence of milkweed in your area –not every area which appears as highly suitable for milkweed is appropriate for monarch habitat restoration (such as the coastal areas of Central and Northern California). 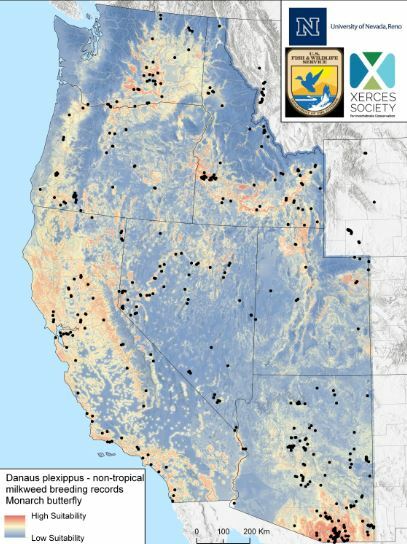 Because habitat suitability modeling is, in part, influenced by survey effort and requires a minimum number of records which are of high-geographic accuracy–we had to exclude the interior western states of Montana, Wyoming, Colorado, and New Mexico due to a paucity of data. However, we know from limited survey work that there is suitable habitat and breeding in all four states and increased survey and tagging efforts in these states would greatly improve our understanding of monarch distribution and habitat use in this region. How are the Models Being Used? The Washington Department of Transportation is using the models to incorporate monarch habitat in their roadside maintenance program to reduce mowing and herbicide use where monarch habitat occurs. The Western Association of Fish and Wildlife Agencies (WAFWA) is using the models as part of their Crucial Habitat Assessment Tool framework for the states to use in their identification and ranking of monarch priority areas. The Monarch Conservation Science Partnership’s Integrated Monarch Monitoring Program is using the models to prioritize areas for standardized monitoring by volunteers. Monarch Joint Venture is using the models as part of their project (Xerces and others are also partners on this project) “Roadside Habitat for Monarch Butterflies” to prioritize roadsides nationwide for monarch conservation actions. The Arizona and Idaho Departments of Transportation are using the models to prioritize roadsides for implementing monarch conservation actions. Multiple U.S. Fish and Wildlife offices are using the models to prioritize areas for monitoring and management for monarchs on National Wildlife Refuges. A pdf of Phase II model products is currently being updated and will be publicly available here (coming soon). GIS products are available for research and planning purposes upon request. Data used in the modeling is publicly available on this website. Phase II included all applicable data available through the Western Monarch Milkweed Mapper site reported through the end of 2017. Citation for Phase II model products: Dilts, TD, Steele M, Black S, Craver D, Cruz E, Engler J, Jepsen S, Jones A, McKnight S, Pelton E, Taylor A, Forister M. 2018. Western Monarch and Milkweed Habitat Suitability Modeling Project Version 2 – Maxent Model Outputs. Xerces Society/US Fish and Wildlife Society/University of Nevada Reno. Available at: https://www.monarchmilkweedmapper.org/habitatsuitabilitymodels. Phase I products have been replaced by Phase II products, but if you are interested in seeing Phase I, contact monarchs@xerces.org for a copy.